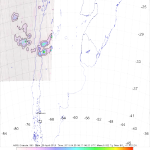 Calbuco Volcano in southern Chile unexpectedly erupted on 22nd April 2015, its first in 42 years. 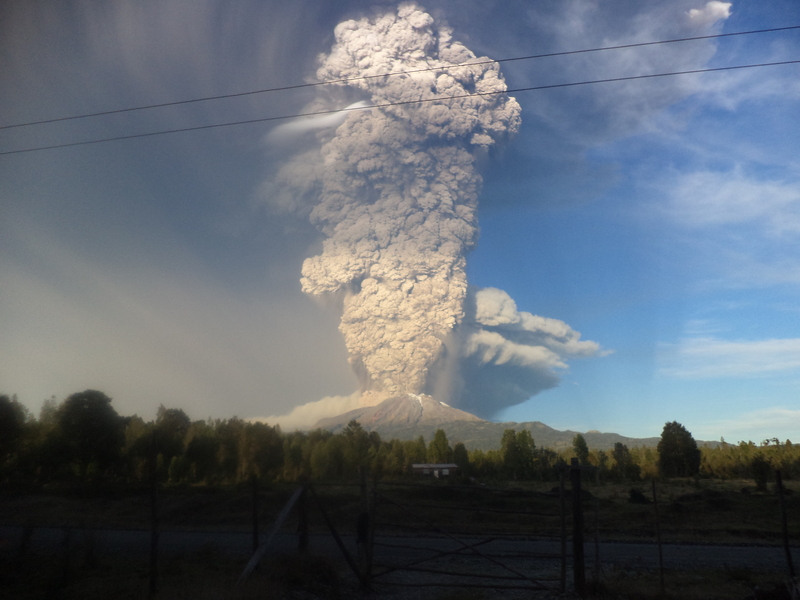 The eruption has resulted in the evacuation of the local population and the cancellation of flights from Puerto Montt airport and from locations in neighboring Argentina. 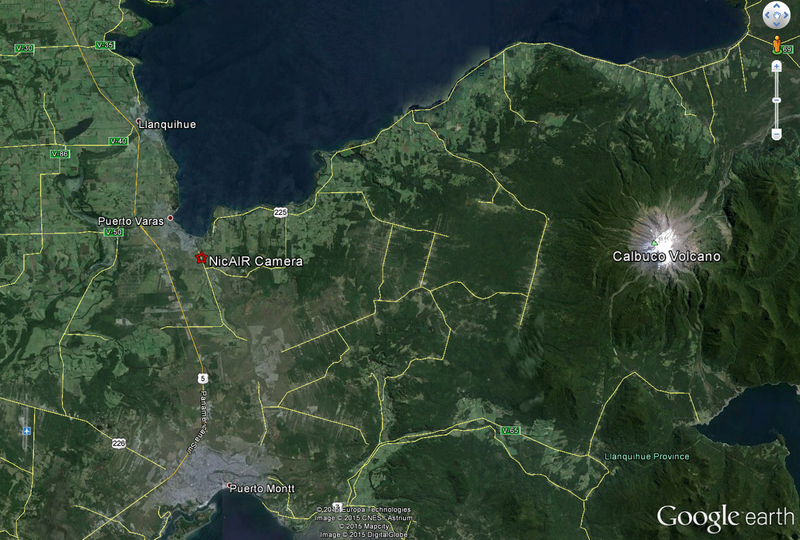 The eruption has been causing flight delays and cancellations (BBC News). Nicarnica Aviation are monitoring the situation closely, in collaboration with our colleagues from SERNAGEOMIN’s OVDAS (Observatorio Volcanológico de Los Andes del Sur) and will use this page to add information as we gather it. 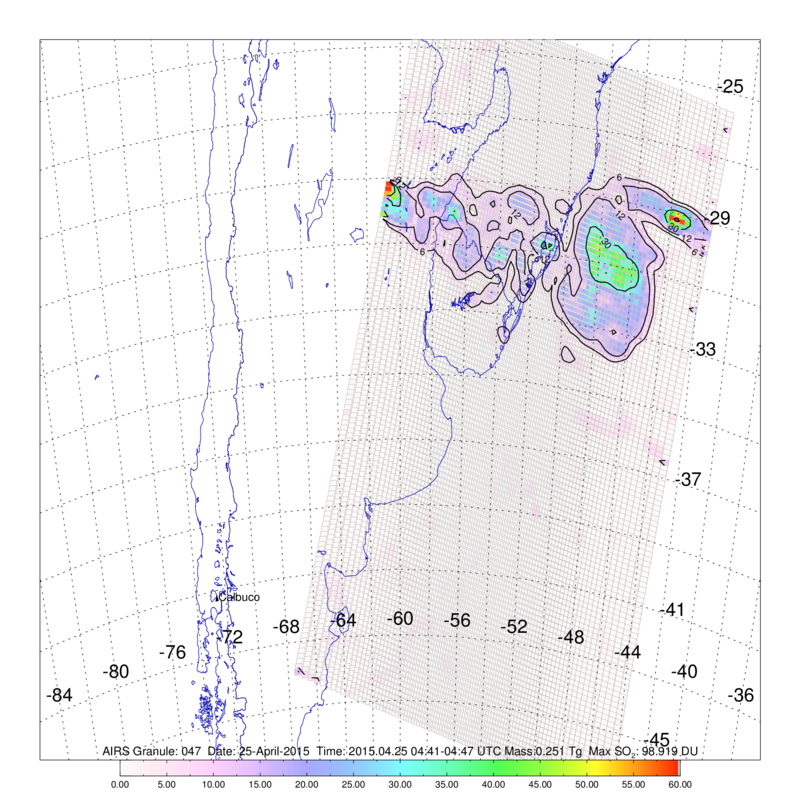 Composite SO2 retrievals from AIRS for April 23-30 showing the long range transport of the volcanic cloud. 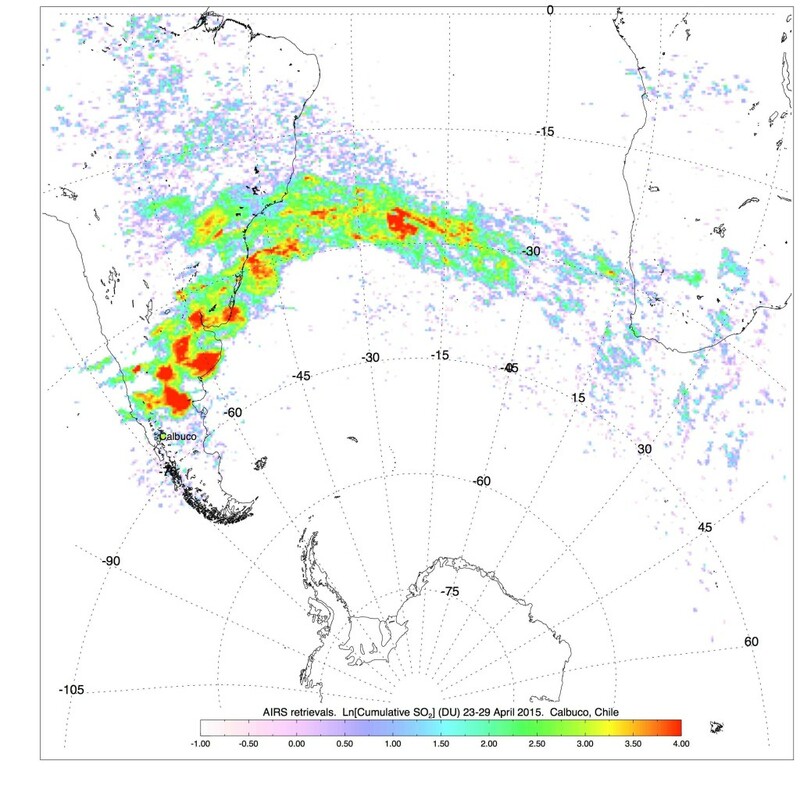 The image below shows a composite of the AIRS SO2 retrievals from 23-29 April. 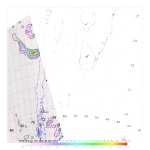 The image demonstrates how the plume was transported across the south Atlantic and indicates a maximum mass of SO2 of ~0.4Tg (+/-20%). 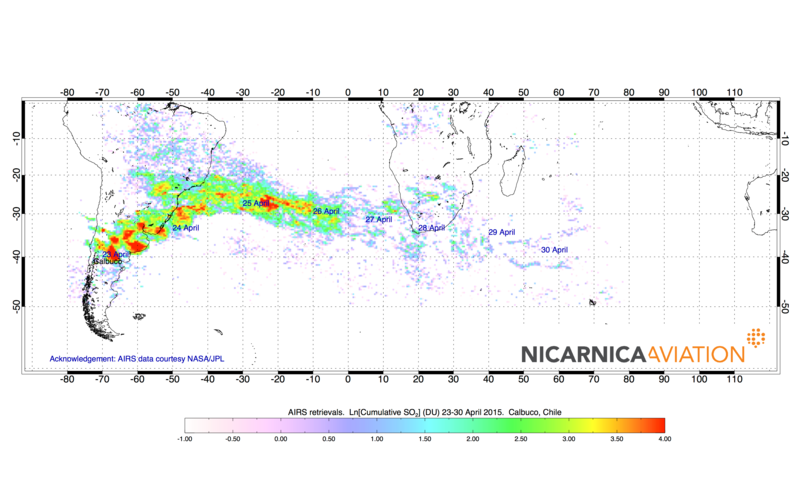 The AIRS instrument, on board the NASA Aqua satellite captured the plume on April 23 and 24. 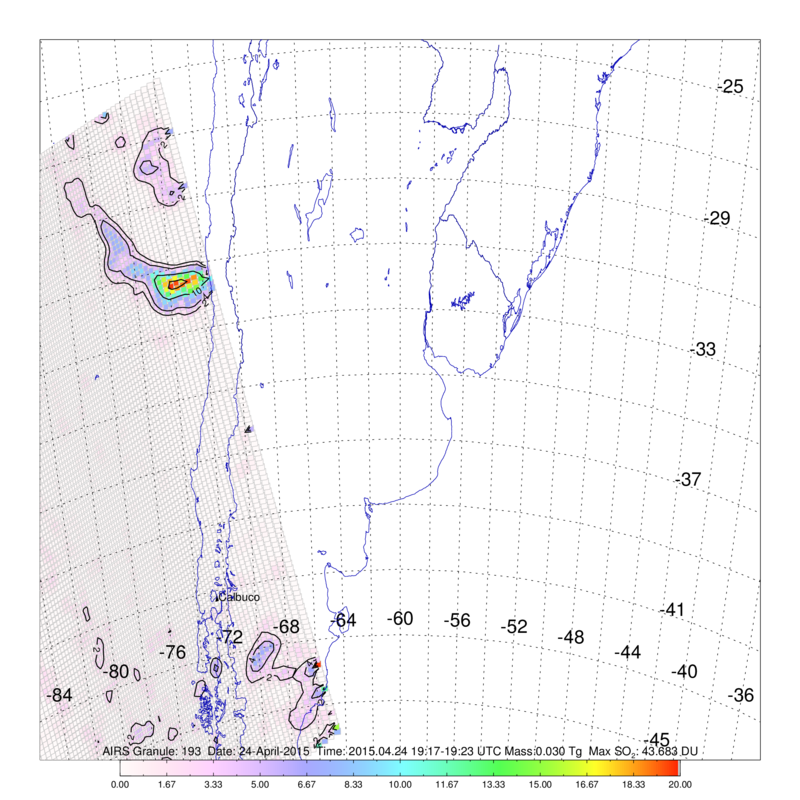 The SO2 retrievals for these days are shown below. AIRS SO2 retrieval from April 23 2015, indicates a total mass of 0.27 Tg. 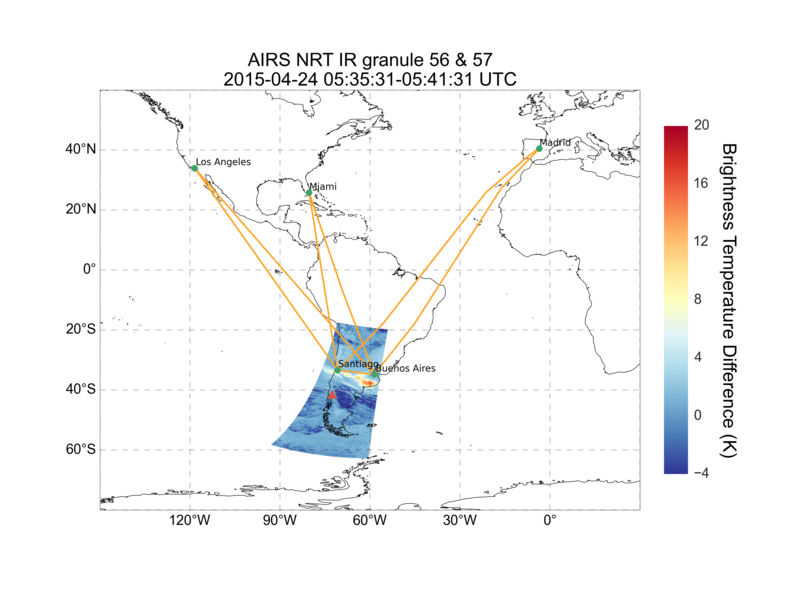 AIRS SO2 retrieval on April 24 2015. 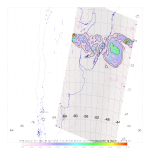 The AIRS brightness temperature difference algorithm can be used to estimate the ash content of the plume. 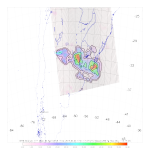 The retrievals below show the dispersion of the ash cloud on April 23 and 24 . 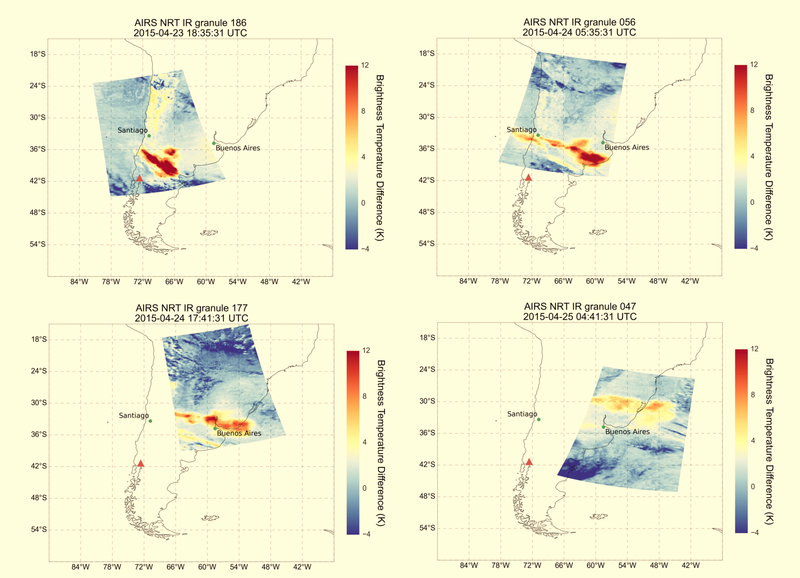 AIRS sequence of images showing the ash cloud dispersion. Courtesy of Andy Prata. 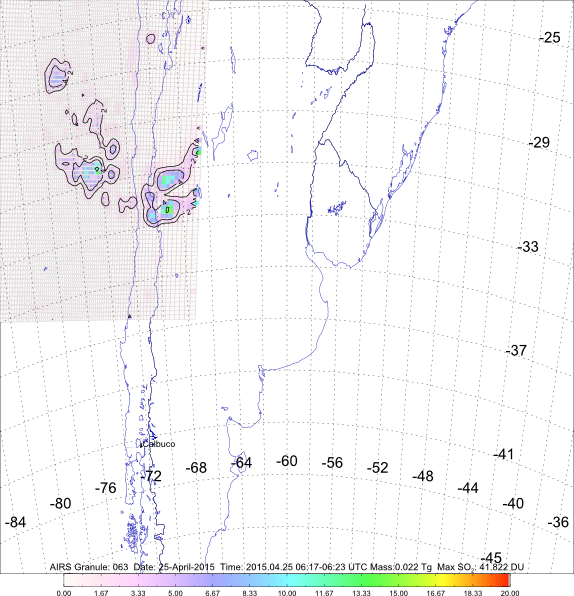 Ash cloud from Calbuco in relation to popular air routes to Santiago and Buenos Aires. Courtesy Andy Prata. 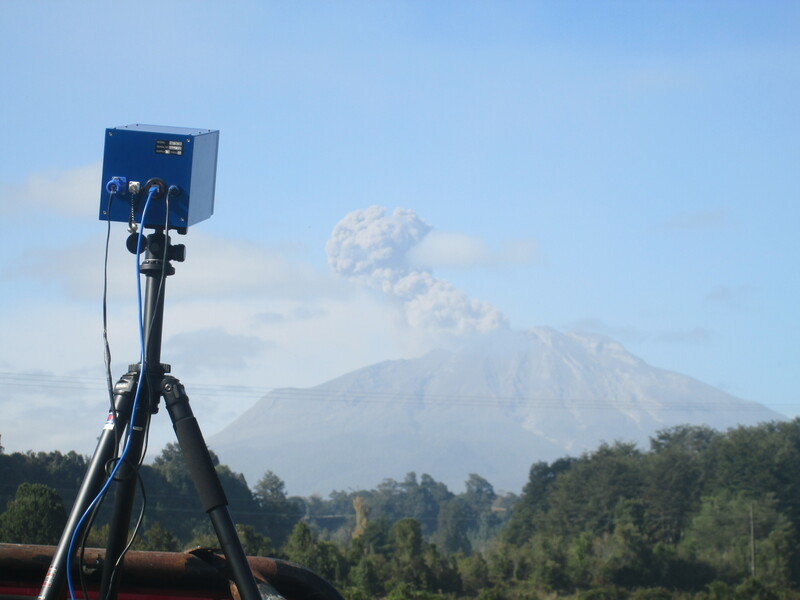 Our colleagues from SERNAGEOMIN’s OVDAS (Observatorio Volcanológico de Los Andes del Sur) were at the site quickly and were able to take measurements of the eruption column using the NicAIR infrared imaging camera. 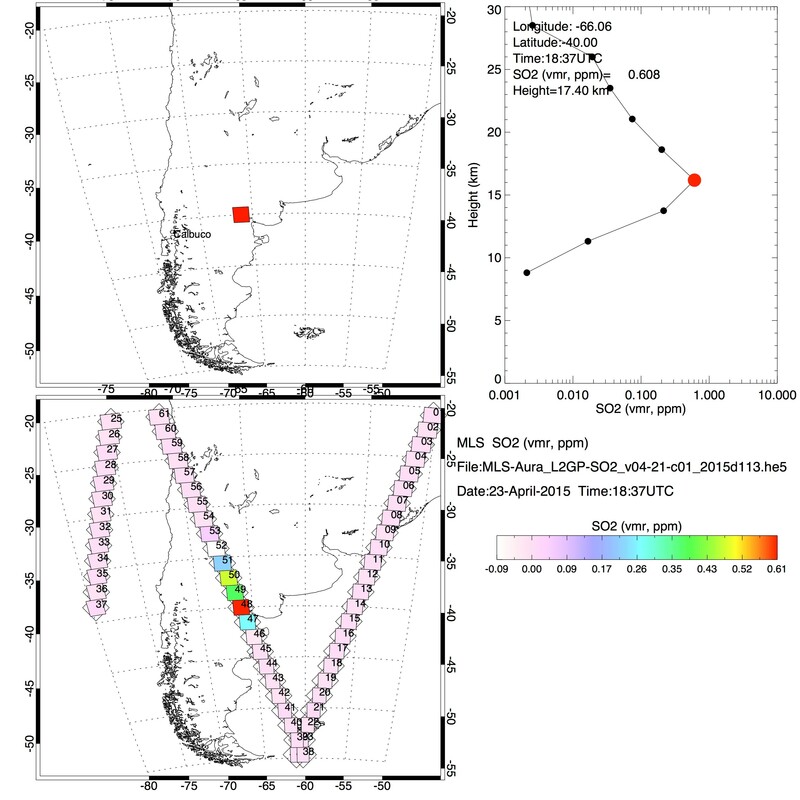 The data below are a sequence images captured between 1 .30 and 2.00 am (local time) on 23rd April, when the camera was located approximately 29km due west of the volcano. 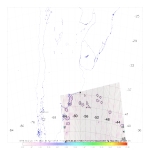 The NicAIR camera measuring at Calbuco during the afternoon of April 23 2015. Image courtesy OVDAS. 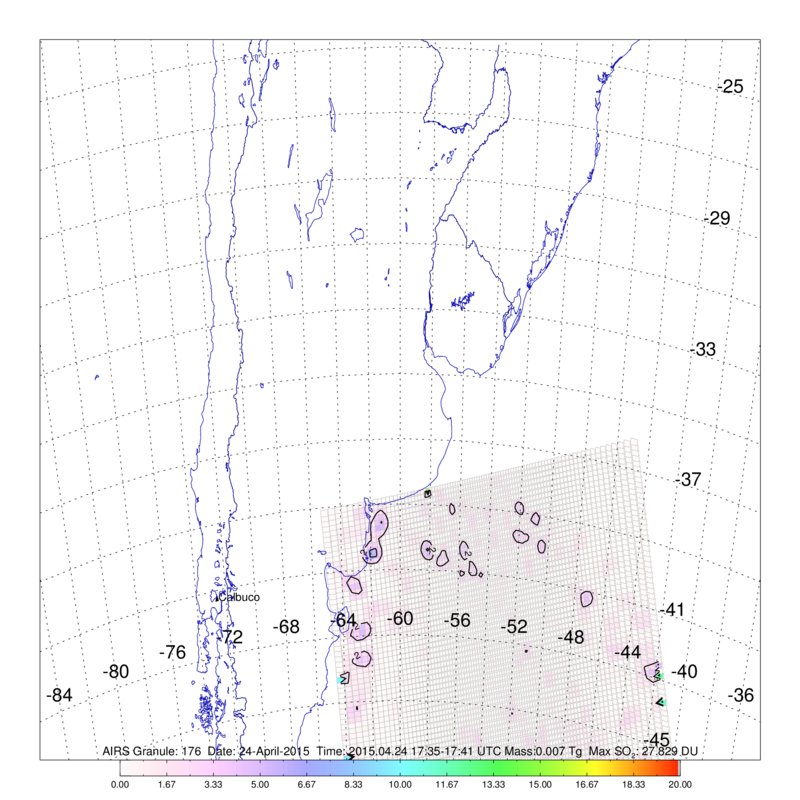 We have performed some preliminary processing using an IR SO2 retrival algorithm which can be seen in the video below. 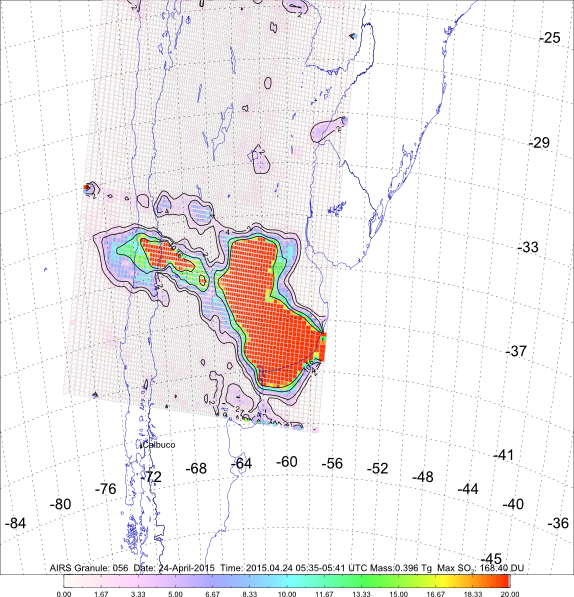 Note that the plume is ash rich and this is likely to have an impact on the SO2 retrievals. 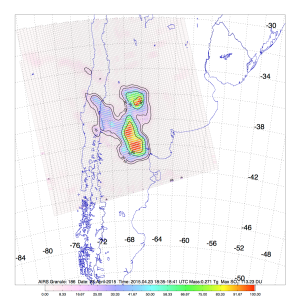 NicAIR Infrared imaging camera SO2 (not corrected for ash) retrieval for Calbuco. 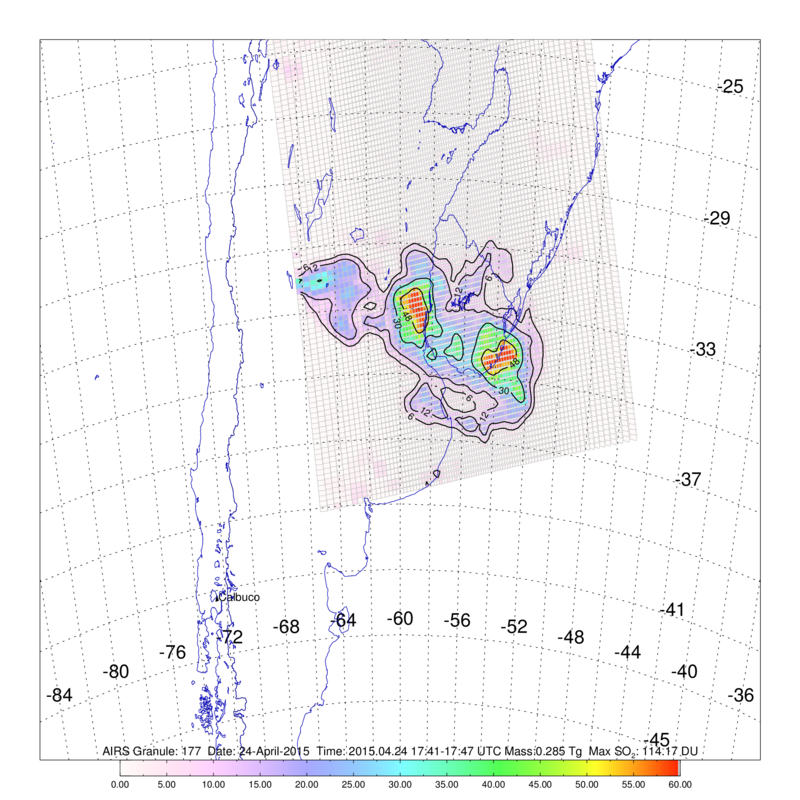 Measurements taken by OVDAS, 29km west of the vent. Click image if the gif is not animated. 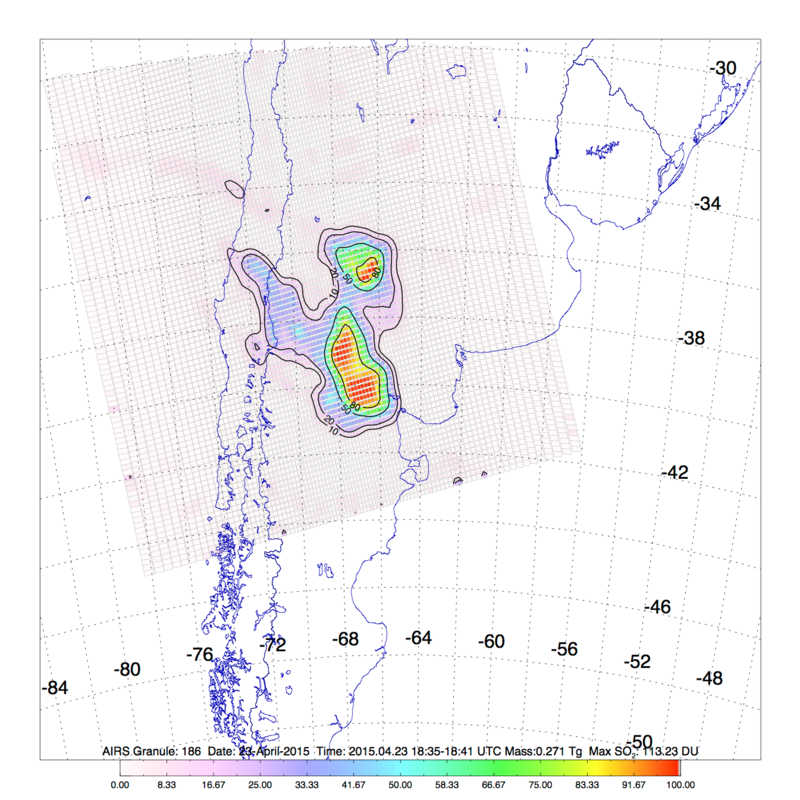 We will analyse the image sequence in order to estimate the SO2 emission rate from the NicAIR camera data. 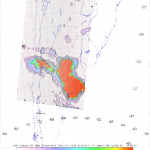 The Microwave Limb Sounder (MLS) is onboard the NASA Aura platform (along with the UV instrument, OMI which is often used for volcanic SO2 measurements) can be used to estimate the height of the plume. 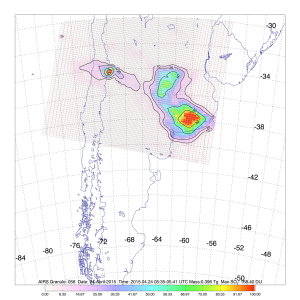 The image below is a plot of the MLS SO2 data product on April 23 and demonstrates the MLS as a useful tool in determining the cloud altitude profile. © 2013-2014 Nicarnica Aviation AS. All rights reserved.